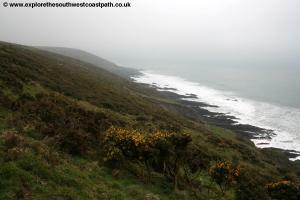 This walk takes in the area between the River Erme and River Yealm on the south devon coast and is a varied walk taking in high rocky cliffs and a couple of excellent beaches. 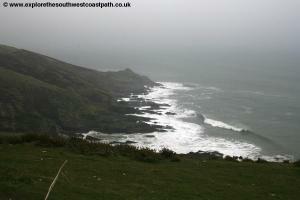 The walk begins with an attractive walk around the Newton Creek and the River Yealm and then climbs out onto high cliffs which we follow east, via Stoke Beach to the mouth of the Erme passing the excellent Meadowsfoot Beach to end on the banks of the River Erme. 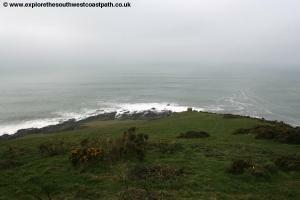 This walk is a difficult one to manage due to the very limited public transport at the eastern end of the walk. 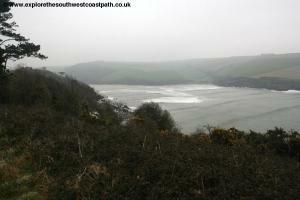 The recommended way to do this walk if you are travelling by car is to park at the car park for Mothecombe beach walk to Battisborough Cross, take the bus to Noss Mayo and then walk back, but there is only one bus a day so you have to be careful with timings. First to get to Mothecombe, from the A38 heading west take the exit for the A3121 (the exit is for west-bound traffic only) and follow the signs for Ermington. At Ermington continue south on the A3121 and then when signed turn right onto the A379 (signed for Brixton and Plymouth). Now take the next road on the left and follow the signs through to Mothecombe. On entering Battisborough Cross turn left and follow this road to Mothecombe beach. The road is partly single-track so care is needed. There is a large grassy car park as you near the beach which is free of charge in the winter and pay on entry in the summer however the car park is only open on Wednesday, Saturday and Sunday as this is the only days the beach is open to the public. 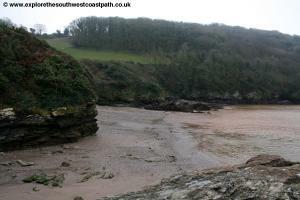 A sign at Battisborough Cross on the road to Mothecombe will tell you if the car park is open. The car park opens at 9am. If it is open park here and then walk back along the road approximately one mile to Battisborough Cross. 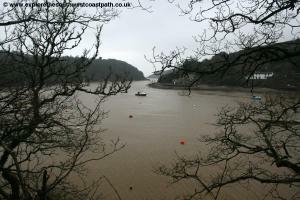 From here there is one bus a day, Monday –Saturday at 09:29 to Noss Mayo. Take this and walk back to your car. There is no bus stop marked in the hamlet but wait on the south side of the road by the village green and seat and the bus will stop if you hail it down. If you arrive at the car park at 9am this will give you time to walk back to Battisborough Cross in time for the bus. Alternatively there is limited on-street car parking at Battisborough Cross which you could use if you are short of time to walk back from the car park or if it is closed. Only buses which operate via Holbeton and Membland serve Battisborough Cross. 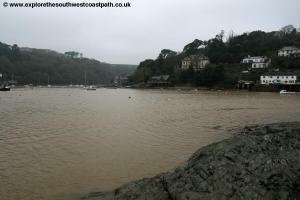 An alternative is to start the walk at Mothecombe and walk to Noss Mayo where you can take the bus back to Battisborough Cross at 14:15 at the time of writing and alight at Battisborough Cross for the walk down to the beach. The bus is Tally Ho Coaches route 94 which runs between Plymouth and Newton Ferrers and Noss Mayo. 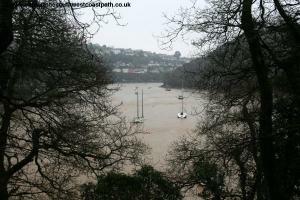 If you prefer to park in Noss Mayo, there is a car park by the tennis courts. There is a bus back from Battisborough Cross at 1425 and you will need to alight at Yealmpton at 14:44 and await the next bus from there to Noss Mayo which at the time of writing is 15:46 arriving at 16:13. If you are travelling by public transport you have two options. Either take Tally Ho Coaches bus 94 from Plymouth (Bretonside bus station) to Battisborough Cross which currently departs at 08:50 from the Bretonside bus station and arrives at Battisborough Cross at 09:29. 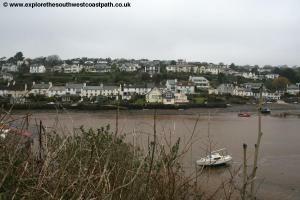 From there walk to Mothecombe to begin the walk and then take on of the more frequent buses back from Noss Mayo to Plymouth. 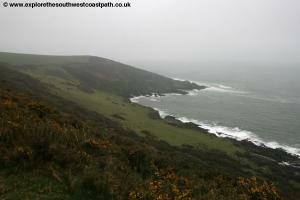 Or start the walk from Noss Mayo and take the bus back from Battisborough Cross at 14:25 (again route 94). To begin the walk start from the car park by the tennis courts which is also where the bus will drop you off. Head down hill turning slightly left with the road to reach the pretty harbour at the top of Noss creek, which itself feeds out into Newton Creek. 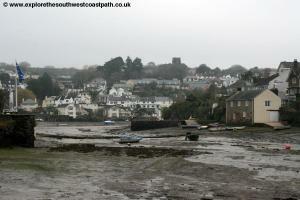 The towns of Noss Mayo and Newton Ferrers face each other over the creek of Newton Creek a very beautiful area. The villages are typically west-country with houses crammed into the steep hills above the river valley making for a very pretty view. From the harbour, take the road up to the left, Passage Road, which is signed as a dead-end (but only for vehicles). 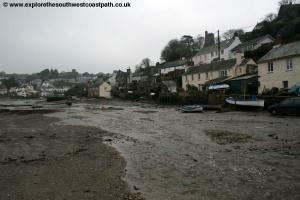 Soon you reach the mouth of the creek and follow the road round to the left, passing the last of the houses in Noss Mayo. Just after this you have a choice. You can either stick to the road (there is very little traffic) or there is a permissive path in the woodland just above the road, which is the more pleasant route. 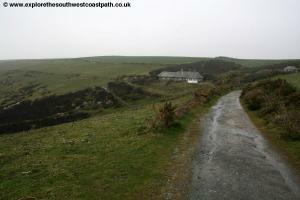 The latter route goes up steps to the left just after the last house and runs parallel to the road. 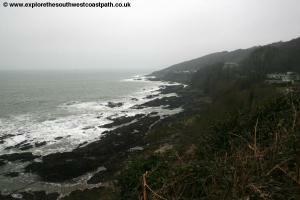 Soon you reach the point where the ferry stops, the continuation of the coast path from Wembury and the first coast path sign. Continue along the road here and just past this point it splits, becoming a track and you take the right most (lower) fork. 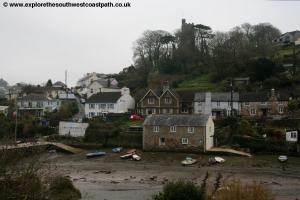 You follow this track round past some houses and soon come to access to Cellar Beach, a small sand and rock beach at the mouth of the river Yealm. 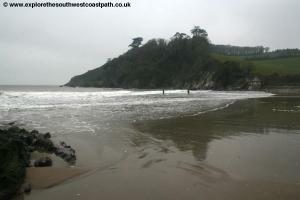 There is a path down to the beach, but it is a dead-end so if you follow it you will need to re-trace your steps. Keep to the main path passing more houses and then entering the woodland of Brakehill Plantation. Soon you leave the woodland to reach Mouthstone Point and have wonderful views over the Yealm estuary and over to Wembury and the Great Mew Stone. Continue on the high-level path rounding the headland and once round continue now heading due east on the main track, the Warren. This passes Warren Cottage where there is a lower permissive path avoiding the garden. 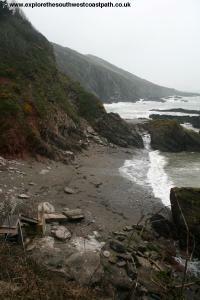 Then you take the looping path around the little beach of Saddle Cove. 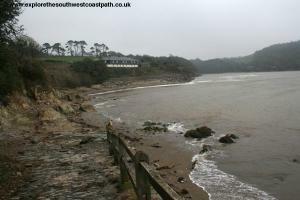 Ignore the path heading inland here once round the beach which leads to the car park and continue on the main coastal path. This continues east passing behind Bridge Cove and Dunny Cove. 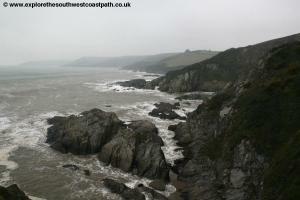 This is a very rocky and spectacular coast and the high-level coast path offers fine views of it. Continue east passing Withie Cove, Pilot Cove and Netton Island. Here the path continues at a high-level over Netton Down where a permissive path goes to the left to a car park, which you ignore. Just after this point you have a choice of routes. 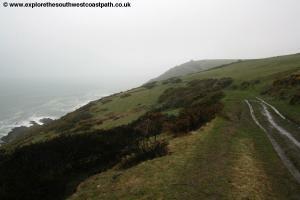 The main route of the coast path continues at a high-level above Stoke Beach passing through the edge of woodland to reach the road at Stoke House. 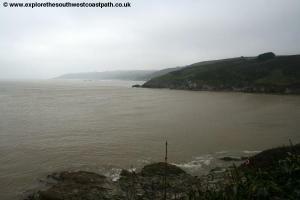 However an alternative lower level path can also be used here to visit Stoke Beach, but it does involve more ascent and descent. 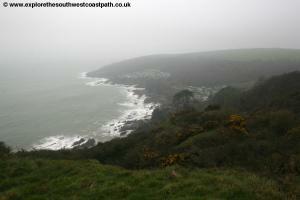 To take this path take the lower path around Stoke Down and then through woodland and into a caravan park. 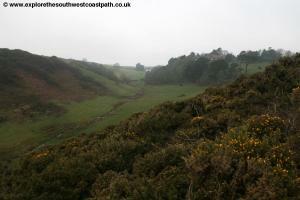 Follow the signed path on the road through the caravan park passing the remains of St Peters Church on the right. 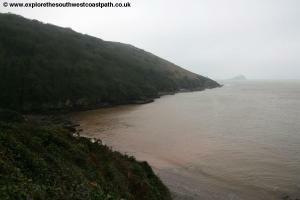 Here the path forks, with a dead-end route down to Stoke Beach. This is a sand and rocky beach accessed via steps which is quiet in winter but can be busy in the summer when the holiday park here is open. 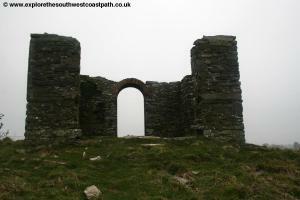 Take the path up to the left up-hill to the road, going through a car barrier to reach the official route of the coast path. The path continue east here at a high-level along the back of the beach passing Highgate and soon reaching Beacon Hill where there is a ruined building. 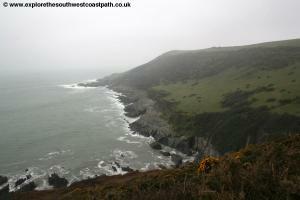 The path briefly turns to the left away from the coast but very soon after you turn right on the signed coast path back along the cliff top. 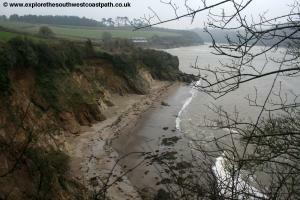 The path continues around Wadham Rocks and Wadham Beach. 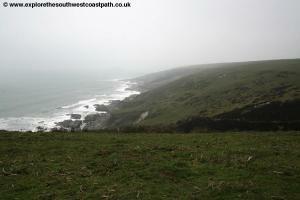 There is a path down to the right to this secluded beach, but the main coast path continues ahead, due east. Continue east through a couple of fields and then after the two fields the path turns to the right, along the western edge of the field and then onto a path between hedges. 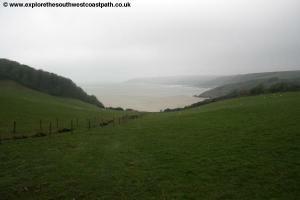 This stretch of the path can be very muddy. The path becomes hilly here descending down and back up around Saddle Rock and then following the coast above Keaton Cove. The coast path then hugs the coast past Gull Cove and Butchers Cove and then descends steeply down to the valley at Battisborough where a bridge crosses the stream with fine views of Battisborough House on the left. 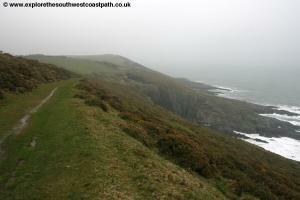 Climb back up the other side and continue around Bugle Hole the coast path then cutting of the little headland of Battisborough Island. You then follow the field edge path ahead and then entering woodland, descend down through the woodland to reach the lovely beach of Meadowsfoot beach. 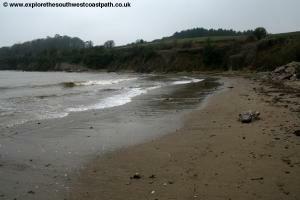 This is a sandy beach at the mouth of the River Erme and is secluded and sheltered. The beach is privately owned and only open to the public on Wednesday, Saturday and Sunday. 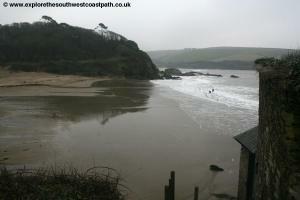 If the beach is open, continue along the back of the beach and take the path up steps at the opposite side. Otherwise follow the track along the back of the beach. Take the steps up into the woodland to round Owenâ€™s Hill and then follow the track down to the banks of the River Erme and the last beach here, with some coast guard cottages above them. 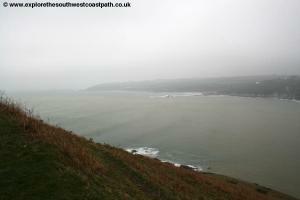 There isnâ€™t a ferry across the River Erme. 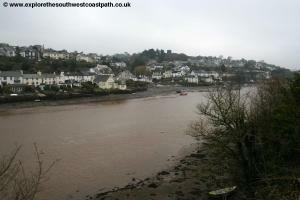 The official route of the coast path here is to ford (wade across) the river here from the slipway to the slipway on the other bank at Wonwell, but this is only possible at low tide (generally within an hour of low tide) and only if the river is not too high (e.g. not after storms or heavy rain). 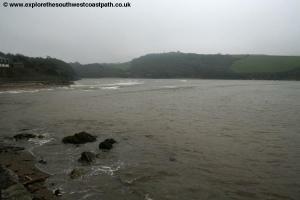 If the sea is rough the waves can often be blown up the river mouth to, which makes the crossing unsafe. For this reason, this walk ends here at the river. If you parked at the car park at the start of the walk, follow the road up to the car park. If not, follow the road passing through Mothecombe keeping to the only road under a bridge (which looks like an old railway bridge, but isnâ€™t) . Ignore the turning on the right and continue along the road, where it turns sharply to the right (ignore a road to the left here). Turn right and you reach Battisborough Cross. 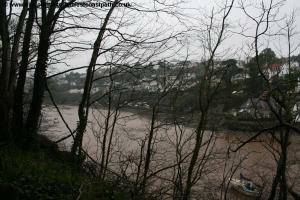 From here there is an occasional bus back to Noss Mayo and to Plymouth. 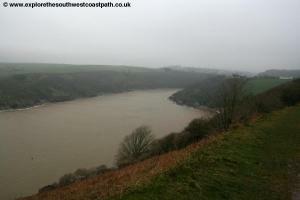 Otherwise a walk of almost 3 miles will bring you to Yealmpton which has a more frequent bus service. As mentioned previously there is no bus to Mothecombe. 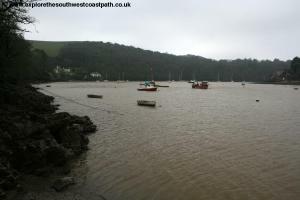 It is therefore recommended you park at Mothecombe in the morning and take the bus to Noss Mayo and walk back. 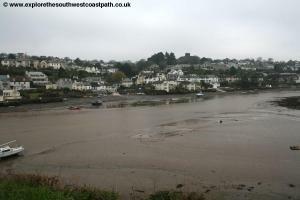 However if you prefer to park in Noss Mayo, there is a bus , Tally Ho Coaches route 94 from Battisborough Cross at 1428 (Monday – Saturday) but it goes to Plymouth so you will need to take this as far as Yealmpton where you arrive at 1444 and then take the next 94 bus to Noss Mayo which departs at 1546 arriving at Noss Mayo at 1613. 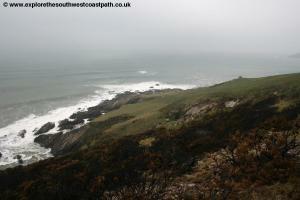 Here are some photos of this walk, sadly taken on a very grey and hazy day. Click each picture for a larger version. 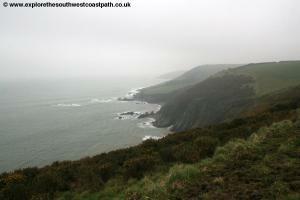 Ordnance Survey map OL20 (South Devon) covers this part of the coast and is widely available both nationally and locally as well as via online retailers.